This is a romantic photograph of the bride and groom that I took at their Roma's Hospitality Centre wedding. Early in my career as a Toronto wedding photographer I learned that it is always better to take the bridal party pictures first, then allow the bridesmaids and groomsmen to enjoy the day and focus only on the bride and groom. That results in better pictures from a multitude of reasons. First, taking group pictures defuses the tension and nobody feels the pressure of being photographed alone. Second, it gives the bride and groom a chance to warm up for their own photo shoot. Finally, the grooms do not feel comfortable taking romantic photographs while the boys are present. However, that changes when no groomsmen are around. As such, I focus on the bridal party for the first 15 minutes of the photo shoot, then tell them they can leave and continue photographing the bride and groom. This romantic picture of the the bride and groom captures an intimate moment when they enjoyed the company of each other. 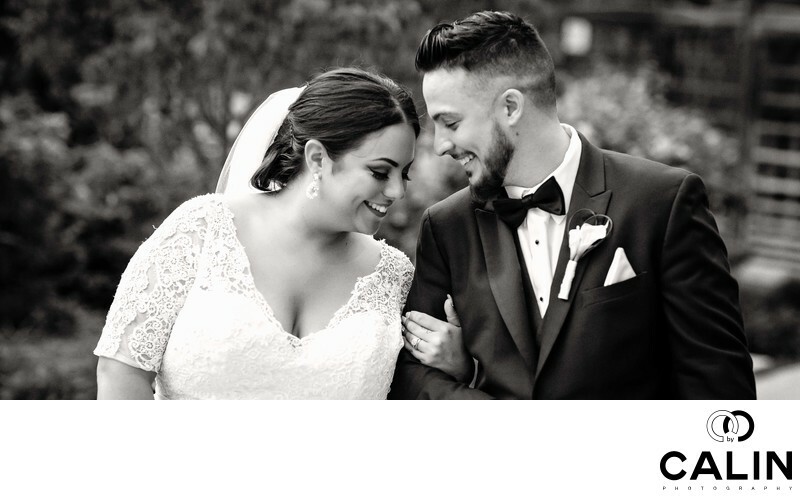 In the shot, the bride is holding the groom's arm and both look at each other smiling. To match the post processing to the candid feel of this image, I converted the picture in black and white in Photoshop. Also, I applied some beauty retouching, added film grain removed a few elements in the background and added a vignette to give the bride and groom prominence in this photograph. Location: 5980 Shawson Dr, Mississauga, ON L4W 3Z6.